Who winds up the watchmen? 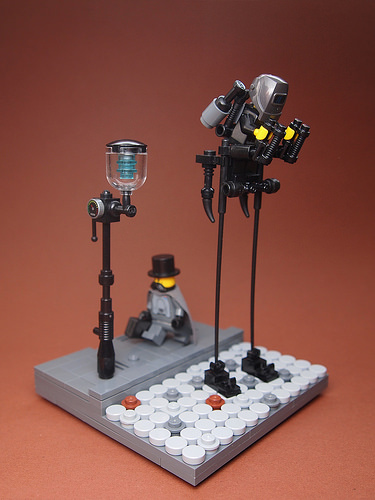 The LEGO watchmen stalk the streets, keeping their eye on a wary citizenry. Dwalin Forkbeard‘s sinister steam-driven sentinel would like to remind you that if you’re behaving in accordance with the law then you have nothing to fear from their oversight. This is great steampunk/clockpunk building. I love the use of the welding mask, the twin-barrel blasters as control sticks, and of course, the design of those fabulous spindly legs. But the highlight of this model for me is the wonderful streetlight. Dwalin says he took inspiration from the Tallboys of the Dishonered videogame. I recognise this in some of the elements, but I also think this has a nice clanky style all of its own.